Anyway, I've finished the first two blocks for In Color Order's HST Block of the Month. Ta-da! This project was supposed to be a scrappy one, but I ended up buying new fabric after all. Remember the salad bowl skirt? I still had some vegetables (thanks to Lianna for providing some more! 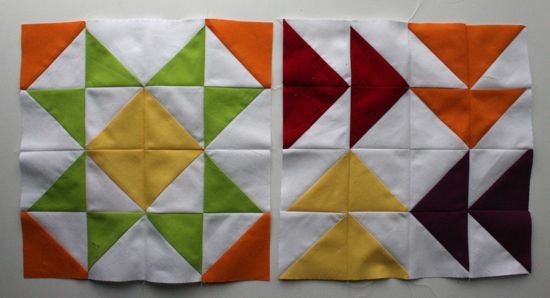 ), so the plan (such as it is) will be to make additional vegetable blocks to add into the collection of HST blocks. Maybe as setting blocks. Maybe more randomly. With one block each month, there will only be 12 HST blocks; this seemed unreasonably small to me, thus the veggie block idea. Of course, all this thinking happened without really realizing the blocks would be 12 inches square. Without borders or sashing, 12 blocks make a 3 ft by 4 ft quilt, which might not be that small after all. Now I'm just over-thinking it. 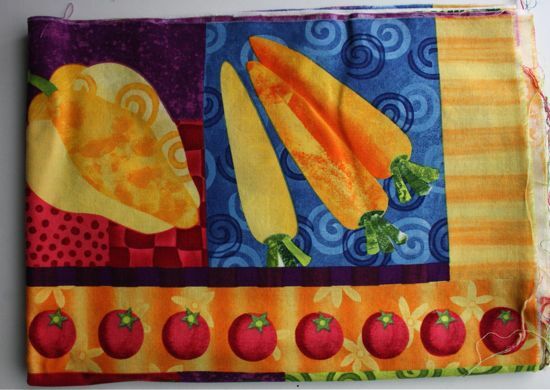 Veggie blocks! That's all we need to know! This project contains several personal firsts. 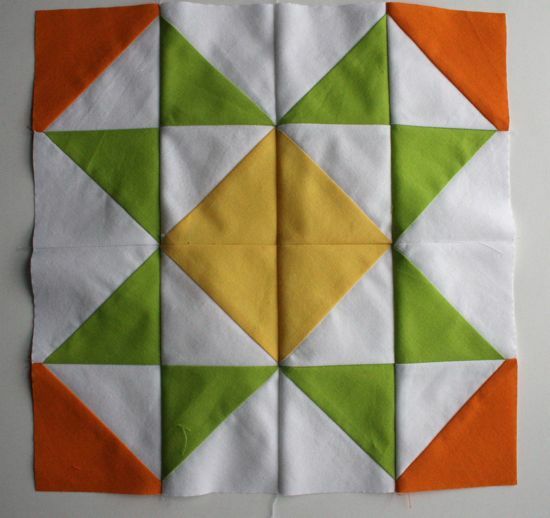 It's my first time working with all solids in my blocks. I think it's only my second time working with a white background (the Bloggers' BOM was first). It may be the first time in recent memory that the blocks finish at 12 inches; so many of my projects have smaller blocks (and smaller pieces!). 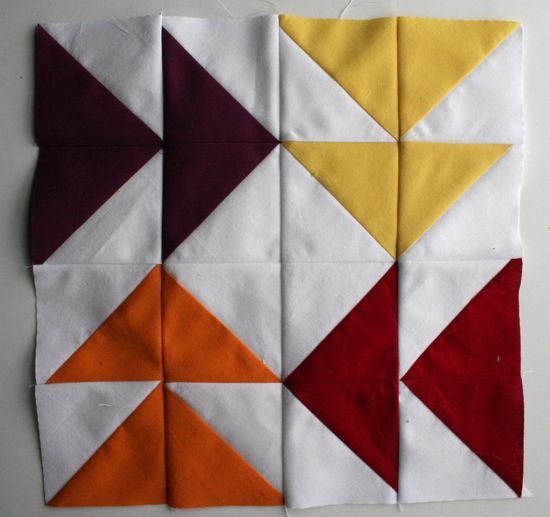 I'm using the new-to-me "alternative" method of making half-square triangles (sew two squares right sides together, cut into quarters from corner to corner, open and press), which is now officially my new favorite HST method. I didn't have any trouble with the bias edges, although that could be because there were several mentions of the edges being on the bias and so I was extra careful. I might want to be more particular about pressing seams open on future blocks. I typically press the seam to one side, which is helpful for matching points, but this habit worked out to be a bit on the bulky side for these blocks. These came out so crisp and bright, and I'm looking forward to seeing the whole quilt emerge.